Earn up to 3,700 reward points. Four-channel wireless system with stage-friendly microphone headsets. 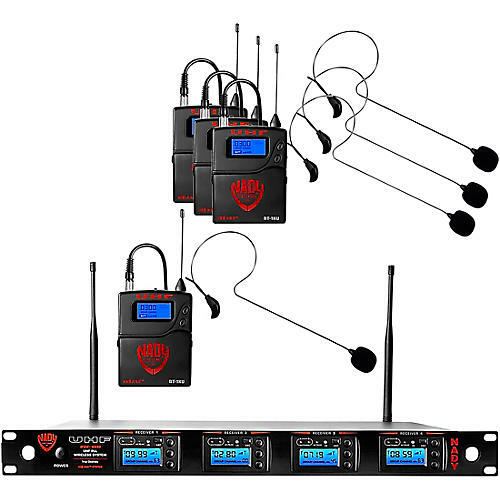 Perfect for events or performances, Nady’s flagship wireless system, the W-1KU, combines many features that set this system apart in the wireless industry. This is a four-channel headset version of the system, which is additionally available in single, dual and eight-channel versions. This one contains four of the HM-45U headsets. This package comes with the 4W-1KU dual receiver, four BT-1KU LT wireless bodypack transmitters, four HM-45U headworn microphones, an AC adaptor, two removable BNC antennas, two extender cables for front mounting the antennas, a user guide and a frequency chart. The BT-1KU bodypack transmitter features a roadworthy all-metal case, power Off/Mute/On switch, flexible external antenna rod and mini locking connector for the HM-10. The HM-45U is a head-worn unidirectional condenser microphone that is mounted on a single earpiece, designed to be mostly invisible on the stage. It is ideal for musical theater and other applications where a headset microphone's visibility might distract from the performance or presentation. It is a wide-bandwidth electret condenser mic that ensures clean, transparent audio and enhanced vocal pickup with improved gain before feedback. It features an ergonomic single-ear design and comfortable fit with or without glasses, hats, or headphones. It is extremely lightweight and provides hours of comfortable use. The H-45U comes with three sizes of foam windscreens that reduce wind and popping noise. Its extendable boom is fully adjustable for optimal mic capsule placement, and is available in black or beige. Four headset mics, transmitters and a receiver that accommodates them all for one low price.